Got back Monday from Detroit. I was an exhibitor at the Detroit NMRA show -- a show for model trains. GFLTC/GFLUG (my local LEGO clubs) had a LEGO display at NMRA along with 9+ other LEGO train clubs. Overall, it was a great show. People were friendly & appreciative of us driving all the way up from Florida to be there. The public (and their kids) were well behaved and amazed. The layout was big enough that there wasn't too big of a crowd in front the of displays at any time. Did a little more drinking than normal -- there was a bar close to the hotel, so after the show, most AFOLs congregated there. So this event, I met someone who worked on the Red-Green show at one time -- he did the special effects on the last 2 seasons of the show. I'm a such a fan of the show, that this just blew me away -- and he's a very nice guy to boot. It might have been me & whenever I talked with people, I began by asking about the drama behind Brickshelf to get the conversation rolling -- nothing like a "hot button" to get people to talk about something. Many were glad that it was back up; they still support it & might support it with cold hard cash. 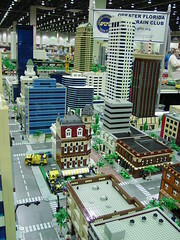 Others fear more LEGO community fragmentation. Others were looking long-term, like in how to keep the site operational. While some of us reflection on Brickshelf's moderation policy & history. Like others, I think if there's a fan-centric image repository web-site (something like Brickshelf, but brought into the 21st century, instead of using 90's technology) it could emerge as the leader. But then the conversation turned towards the classic developer vs. systems-architect argument of either rebuilding the web-site from scratch vs. taking an existing solution & customizing it to fit the community's needs. It's the same 80%/20% problem to me. :) Either the developer's delima (80% development completed on a new project vs. 20% left unfinished in the end) or the systems-architect's delima (pre-existing software off the shelf will only meet about 80% of the community's needs with customizations & the other 20% not able to be completed because of the software's structure). Either way you reach the same goal, but it depends on time & money at that point. Anyway, how we build that better LEGO community shouldn't prevent us from striving for a better LEGO community. Now if only we can change people's attitudes on being so club-centric and be mature enough to assist other clubs in set-up/tear-down, when there's a surplus of people... :) It took Robin & I nearly 4 hours to tear down our display. We did have a little help -- I do appreciate that -- but to have a few extra hands, especially since Robin drove 21+ hours to attend the show.